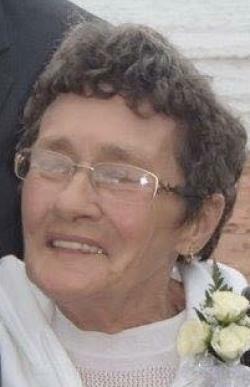 Peacefully, at the Beach Grove Home, Charlottetown, on Monday, September 3, 2018, with her loving family by her side, of Shirley Mary McCue, beloved wife of Wilfred J. McCue, formerly of Christopher Cross, age 79 years. Born at Skinners Pond, P.E.I. on April 18, 1939, she was the daughter of the late Thomas and Margaret (nee Handrahan) Bernard. Loving mother to Donna Harvey (Farrell White) of Nova Scotia, Karen (Justin) Arsenault of Charlottetown, Joey (Myrna Doyle) of Tignish, Robert of Tignish, Becky McCue (Darrell Vessey) of Brookvale, Charlene Doyle (Tony McKinnon) of Murray River, Junior of Alberton, Ronnie (Sandra) of Tignish, Esther McCue of Toronto, and Laura Lee McCue (Glenn Urie) of Stratford. She is also survived by 22 grandchildren and seven great-grandchildren. She is also survived by her large extended family members. She was predeceased by a grandson, Jake McCue, and by a granddaughter Savanah Cooke. Resting at the Rooney Funeral Home & Chapel, Alberton, for visiting hours Wednesday, 5:00 to 8:00 p.m. Funeral Thursday afternoon from St. Simon and St. Jude Church, Tignish for funeral mass at 2:00 p.m. Interment in the Church cemetery. As an expression of sympathy, memorials to the PEI Mental Health Association or to the Canadian Cancer Society would be gratefully appreciated.